A reader of this blog has been on a personal odyssey for the past year. In a letter she sent us today, Pam, who lives in New York State, describes how she got to the point of feeling compelled to engage in some personal research on Israel and the challenges it faces. The process was triggered during the tumultuous days of last summer’s Operation Protective Edge when she found herself in discussion with a Palestinian friend on Facebook. 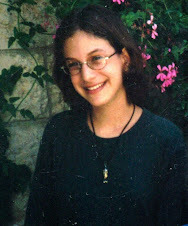 Her friend's claims were so damning of Israel that she felt the need to personally dig into sources and separate out what was truthful from what was not. Some days ago, she was invited to a local event. It looked innocuous enough - in her words “perhaps even worthy”. She looked a little more carefully into the cause promoted by the hosts of the gathering, and then she sat down to reply to them earlier today. Pam has kindly allowed us to share her letter here. I am going to decline this invite. I thought this speaker would be at a public venue, and not breaking bread with us on Rosh Hashanah. I don't break bread with patriarchs of a terrorist clan, nor do I break bread with people who engage in child abuse. Yes, I believe indoctrinating your children with hate and encouraging them to commit crimes, including orchestrating suicide bombs to kill innocent people is indeed child abuse. Bassem's beloved daughter did just this. I understand that he is very proud of her. And well, I think we can surmise which direction his daughter "Shirley Temper" is headed. People are not born with hate in their heart; they are taught this. 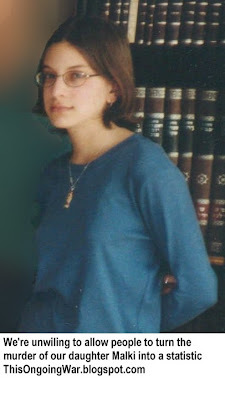 One of the victims of the Sbarro massacre was Malka Roth. She was 15 years old, and her only crime was eating pizza. Her father and mother have had to live with this tragedy for the last 14 years - their daughter taken from them in such a horrific way. Do you have children? The loss of a child is indescribable. By having this man to dinner, one could infer that you condone these behaviours. I certainly don't. I take it upon myself to educate my fellow humans on the truths about Israel and the lies of many Palestinians, a narrative that gets oft repeated but clearly violates any semblance of reality. I also learn a lot from people like Bassem Eid, a true human rights advocate. Or Mudar Zahran, who is also Palestinian who speaks about one of the core issues of the Palestinians, all calls for violence must end and the right of return for descendants of refugees to the State of Israel will not happen. Palestinians have a unique definition for "refugee" that is not used by any other ethnic group on the planet - none. Bassem's urging of Pallywood charades do no service to his family either. His cute little son can't even remember which arm to wear his cast on as it keeps floating from one arm to the other. What kind of man, what kind of father encourages his child to engage in this behavior? Or should we conclude that this poor child has had multiple bones broken, in both arms, thereby requiring him to always wear a cast. If so, how horrid is this and shouldn't someone be looking into this? Peace will only come when Palestinians can elect a government that does not encourage violence towards its neighbours, in the form of rockets, stabbings, cars running over innocent people, or "by any means possible". They need to stop spreading lies that Israel wants to destroy the Al Aqsa Mosque which is a complete fabrication. You do know that none of us here can even pray on the Temple Mount, yes? That sure sounds like religious discrimination to me, as a Jew. They need to stop wishing for a Judenfrei land, because that is their wish. Arabs that stayed in Israel after the war and are Israeli citizens are some of the best cared for Arabs in the entire Middle East, with full citizenship and all that it entails in any democratic society. The ones that left and "settled" in other ME countries such as Lebanon, Egypt and Jordan cannot say that about their own plight which is truly the tragedy. Israel ethnically cleansed thousands of Jews out of Gaza only to be thanked with suicide bombings and more rockets. My people have been virtually expelled out of the entire MENA area but that is not good enough for them. They want all of the Jews gone. Great, Muslim majority countries are doing such a bang up job with the countries they already have. Thank G-d for Israel's existence. Never again means that Jews from all over the world know that if circumstances were to change violently, as we are starting to see in many countries - they will always have a safe haven and Israel will protect them. Israel does more for its own people than any Arab country has ever done for their own, such as the Palestinians. So in conclusion, I am shocked that this man is allowed to fly freely into my country, as clearly child abuse is a crime. Encouraging and inciting violence is also a crime. However, what is important to note, is that Israel does allow him to fly. Sure sounds like oppression to me, said no one sane ever. I can continue to educate humanity about the truth behind this conflict and G-d takes care of the rest. You enjoy your Rosh Hashanah as I will enjoy mine, as I continue to pray for innocent people being killed for being Jews. We hear that Tamimi is going to be speaking at locations across the US in the next two weeks. We wonder whether he's going to explain in a frank and honest way the things that can be seen in the following photos. Let's call them the Nabi Saleh Photographer Swarm. 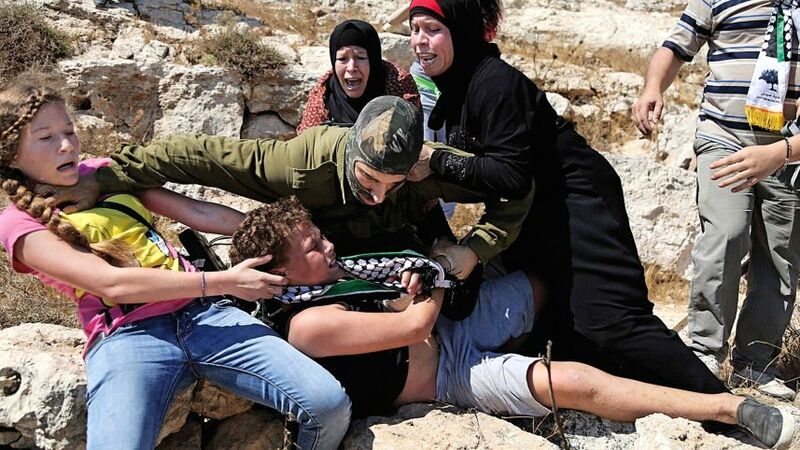 These photos were taken from just behind where the now-famous boy-in-the-headlock scenes were captured in the little village of Nabi Saleh this past Friday. We became aware of them only today. They can be seen at a French site here. The man in the green shirt above is Bassem Tamimi, proprietor of Tamimi Press and arguably the producer/director/screenwriter of the entire show, a weekly production as many know but which the working media rarely reveal. Green-shirted Tamimi can be seen leading the march towards the staged "clash" with the IDF forces at the start of the Tamimi Press video of the Friday performance (here). Those pictures above show the camera men pointing their lenses at a couple of children, plus women, who are shrieking, screaming and wrestling with an armed IDF soldier about, let's guess, eight feet from Bassem's face. Here's the thing: the little boy is his. The shrieking and cool-as-a-cucumber girl ("Shirley Temper") is his. One of the women is his wife. And what does Bassem, the father, do in the face of the violence that seems to have been inflicted on his family out of the blue and for no reason whatsoever, at all? He stays out of sight and as inconspicuous as possible, away from where the cameras are pointing, on the perimeter, as these little-publicized photos show. Not intervening for a moment, he's evidently making sure - as a director should - that the images are captured to plan. And then once captured, fired out into the battlefields of the newspapers, TVs and web screens of US and Europe and beyond, because for him this is cognitive war. He and his family are soldiers. Europe and the US are the strategic goals. Why should he intervene? It's fairly clear that, knowing what Bassem Tamimi knows from years of weekly charades like this one, he remains calm and unflustered throughout because he's well aware his family members are in no serious danger of anything other than slip-and-fall injuries. Syria, this is not. It's not even Ramallah. What this is, friends, is a minimum-risk operation, with a huge return on modest investment, underwritten via the willing collaboration of a host of camera-operators, reporters, headline writers and cable news presenters. People are going to be studying the lessons of this shabby, child-abuse-rich affair for years to come.